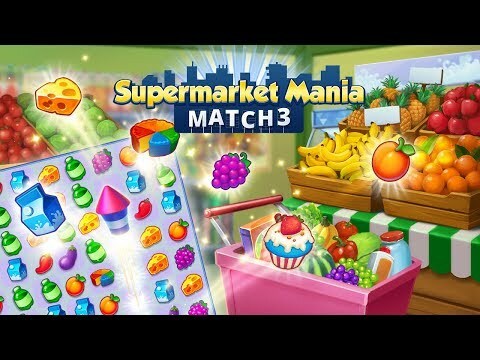 Dive into Supermarket Mania® - Match 3 – an exciting puzzle adventure! Roll up your sleeves! It’s time to switch and match treats on hundreds of unique levels to open new supermarkets and expand your grocery chain. If you have ever wanted to run your own business, then seize this opportunity and see how easy and fun it could be! Together with Nikki, head to her native Tinsel Town to make a contribution to the city’s development. To keep your supermarket business growing, you will need to beat hundreds of puzzling levels by matching three or more identical treats. It’s easy to play but challenging to master, so better plan your steps to meet all targets before you run out of moves! Knock down annoying obstacles by driving over them with a turbo cart, and use and combine other special boosters and power-ups. Challenge yourself to become a supermarket expert in this exciting match-3 puzzle adventure and open a record number of grocery stores across the city! Swap and match treats to get special-powered chips! Collect medals by completing levels to open new chapters and win great rewards! Supermarket Mania - Match 3: Shopping Adventure Frenzy © 2018 - 2019 G5 Holdings Limited. Published by G5 Entertainment AB. registered in the U.S. and other countries. iPhone and iPad are trademarks of Apple Inc.